The day I thought would never come, came. Jung Yonghwa finally addressed sasaengs, aka stalkers. The fans who went to his apartment during the Chuseok holidays when his parents were visiting must have done something terrible that JYH, who is known to be tolerant with fans in general, felt it necessary to address the issue on his Twitter and Weibo. 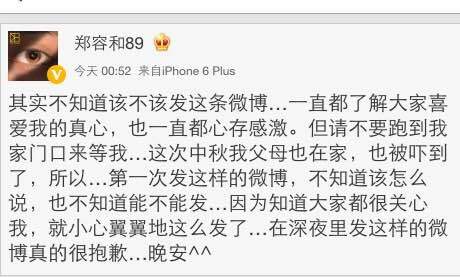 And even then, he was apologetic and quite hesitant to post what many K-pop entertainment sites dubbed as an appeal. Just come to think of it, this guy whose privacy has been breached is still the one apologetic for having to call out people. He should just have called the police instead. Stalking is par for the course for celebrities. They get followed by fans and paparazzi alike that there’s very little space left for their privacy, including their home which is their sanctuary from all the sh*t that the entertainment business deals them. Ironically, JYH’s pad has been featured in his Hologram and his V app episode (and occasionally, on his SNS photos) so most probably, fans thought it was all right to go there, the same way some fans visit locations and sets of dramas. I don’t really get how fans get off stalking their idols. Apparently, watching them in concerts or seeing them up close at fan meets are not enough. And it’s not just about stalking them all the way home, even following “oppa” during his private time or non-official schedule is not okay. I guess when you give your hand, they want the arm and the whole body and watch you eat, sleep and breathe too. Creepy, if you ask me. South Korea’s stalking law is quite weak too with a mere 80,000 won or a paltry US$70 fine for stalkers. That’s loose change especially for fans who can afford to travel to oppa’s homeland or have the luxury of time and resources to follow him around (I use “oppa” loosely here to apply to all male idols and just in case #sarcasmhashtagforidiots). But it all boils down to self-respect. There are lines that you just don’t cross, not only as a fan, but as a human being. 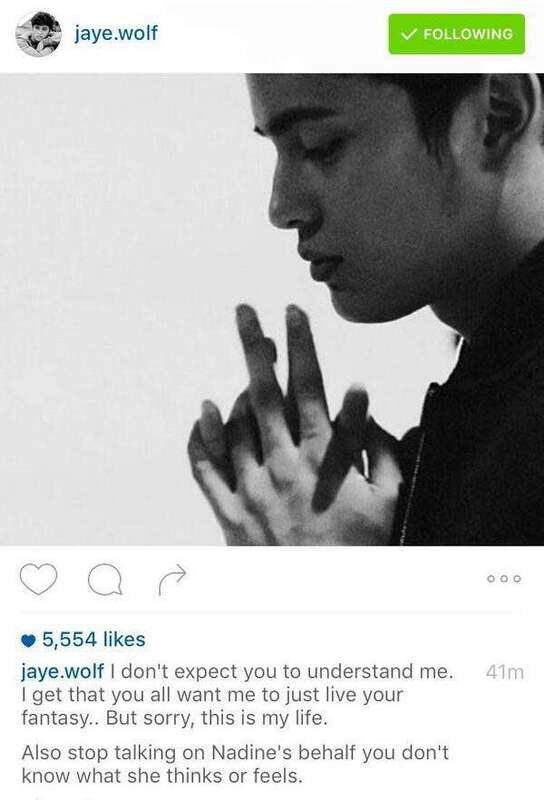 Celebrities are entitled to their privacy and their own lives…right James Reid (I had to segue). If JYH was diplomatic, James Reid was blunt. Too blunt for many of his fans and shippers. James has become famous not only among Filipinos but with those who are watching On The Wings of Love. Maybe it’s because he is not pandering to his audience that I find it refreshing; we already have enough of celebrities who care too much about their image that they end up being a fraud. On the other hand, I do get why some fans, especially those supporting his loveteam, are unhappy. It’s not that they want James to sell them the illusion that he is in love or in a relationship with Nadine. But they just hope he would be discreet because after all it is not just his rice bowl on the line. It’s his loveteam’s rice bowl too–and if you are one-half of a successful loveteam in the Philippines, that is big business. Whatever he does in public reflects on Nadine and may have an effect on their collaborations, from dramas to endorsements. It’s one thing to be honest and genuine, but it’s another thing to be irresponsible and totally disregard his fanbase’s support, without which he would be nothing. Let’s face it, celebrities are only as good as their fanbase. Which brings me to the third case…the Curious Case of Fisherman Ohno. 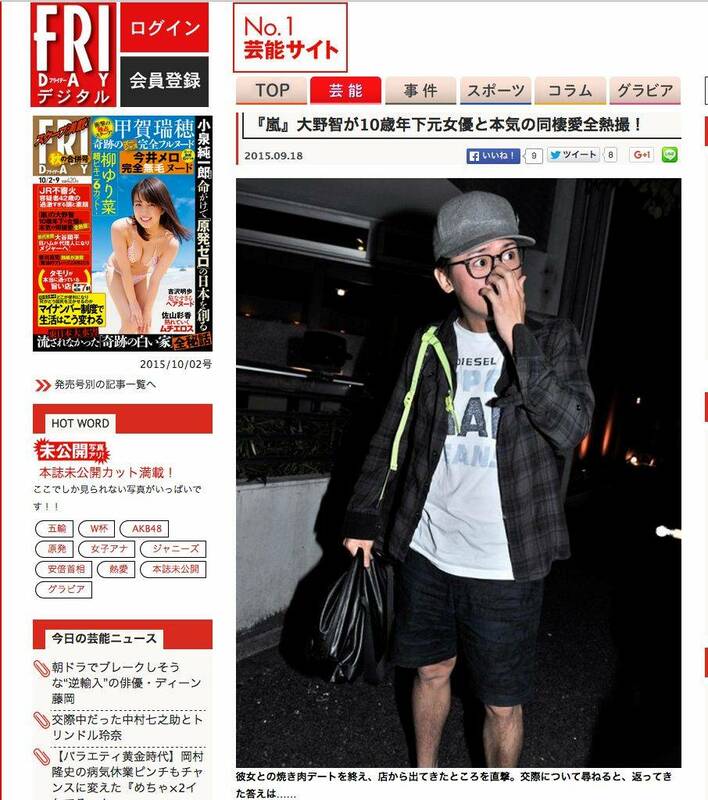 Arashi’s leader was tangled not in a fishing net but in a scandal two weeks ago, linking him to an ex-actress 10 years his junior. Arashi fans were Fridayed and don’t ever underestimate the Fans Bureau of Investigation because in just a few hours, they managed to track down the girl’s SNS (the girl’s name was not mentioned and her face blurred from the paparazzi pictures). It was not pretty, prompting the girl to delete some “incriminating” photos (not wise, but even not wiser was how she kept a public SNS), take her display photo down and eventually lock her Instagram altogether. Whether he was forced to say what he had to say is anybody’s guess, but we also have to understand that Ohno Satoshi is not only responsible for himself. He has to answer for the four other people in Arashi, and the people working under them. Never mind our fave old man Johnny, he’s already rich. But there are people depending on Arashi and as their leader no less, unfortunately, Riida had to keep that balance between personal interest and the greater good for the group that has made him one of Japan’s most successful idols. Now, Arashi are in their 30s. Men their age have families already and with the recent marriage announcements among Johnnys, they have been subject of speculations as to when it will be their turn. Obviously, it’s just a matter of time. They have given their fans so much happiness that I can only wish them happiness. Whatever choices they will make in their lives, it’s their choice. (And I don’t have to like the girl they date because…I’m not the one dating them after all). The artists we support only owe us their work because that is how our relationship is with them. We are not their family nor friends. And even when it comes to their work, we always have that choice to stop supporting them if it no longer interests us. But no, they do not owe us an apology for calling out bad behavior, not on the choices they make, and certainly, not for protecting their privacy and especially, not for living their lives. Or better yet, ask Uncle Bob. I totally agree in almost everything you wrote. I still can’t believe what sasaeng fans did to Youngwha and seeing him apologizing about something that he is the victim makes my heart break. I’d like to say that he can put out all his anger/frustration, but I know he can’t do that. However, about the phillipino actor, (sorry, I don’t know about him and I was a bit lost), I think you contradict yourself at some points, specially Bob Dylan’s phrase, when you say “It’s one thing to be honest and genuine, but it’s another thing to be irresponsible and totally disregard his fanbase’s support, without which he would be nothing”. I got what you talked about Nadine’s life and, please, don’t think that I support sasaeng or that I think “oppa” is mine, but even if they don’t owe us more than their works, we all know that this isn’t how things really works. They are public figures and even though I hate people telling others they should apologize, even when they do not regret what they did (or doesn’t have a real reason to do that), I know they will face this pressure even if they aren’t told to do so, it’s social coercion. In my case, I do what you said. If an artist makes something I don’t agree, being direspectful without a reason or being drunk and having car accidents for example, I would stop supporting this person and keep living my life, I’m no one to tell him/her to change, but, the moment it starts to affect his/her career, specially in kpop that fandom it’s a huge and important thing and 99% of the time they are treated like a merchandising, they end up owing us something. For me, the problem it’s when they ask the soul of the artist, when you think because you vote/buy everything/give expansive gifts/show your “support” all the time they are yours. Your children, parents, friends and girlfriend/boyfriends aren’t your belongings, so why does your idol is? He can be your hidden fantasy, but you can’t live it on real life. Summarizing, famous people aren’t ours, but they ended up owing things to us. It can be what we normally demand for any people to the extend of thinking you have the “right” to choose when “oppa” can marry (what I totally disagree, but it’s understandable when you think, in this case, what sustains kpop ). just to clarify — on the James Reid part, I was taking both POVs of their fans into account so naturally they would contradict. I’m still of the thought though that what he did was right, I’d rather him be genuine with his feelings than go along with the manufactured loveteam spin that they’re together when it’s all for show. one thing I hate the most, and which will make me lose interest in an artist I like, is when I know I’m being taken for a stupid fool. “we will never see each other again.” that part is so crushing. thanx for the post and i agree ohno seriously has alot of weight on his shoulders. and he has so much love for team arashi, which includes so many people. what he said still makes me sad tho and i hope he can date happily and keep from crazies finding out until he chooses to come out with it.